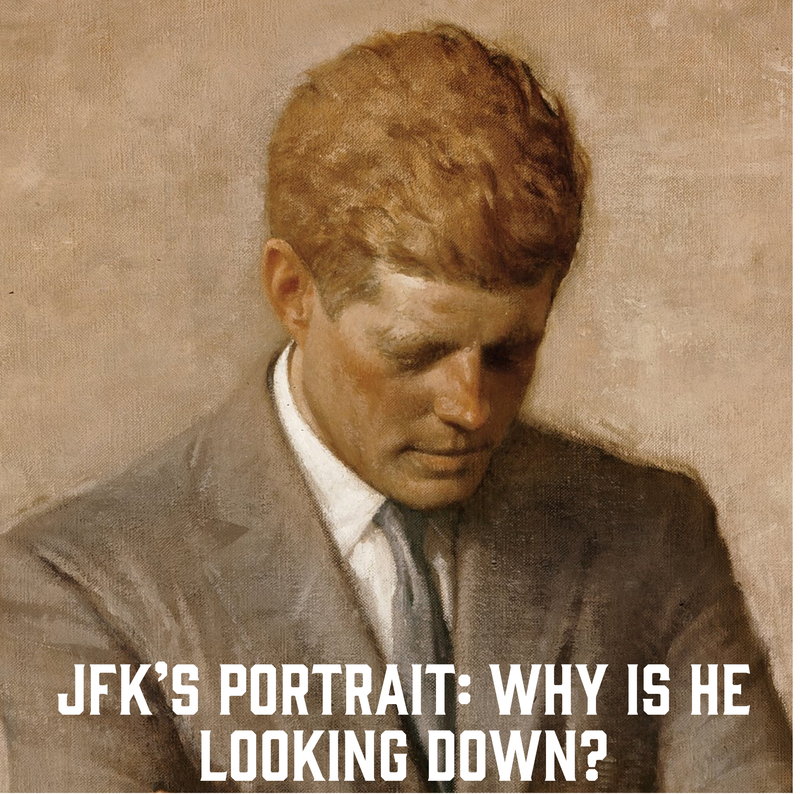 JFK’s Portrait: Why is he looking down? It happens every school year. Whenever my students flip through the presidents’ portraits in the back pages of their textbooks, a question always arises: “Why is JFK looking down in his painting?” It’s a good question. If one looks at the presidents’ official portraits, it becomes very clear that Kennedy’s portrait is unique among the other portraits. But, why did the artist paint Kennedy in this pose? So, Shikler started sketching the president’s image, and he finally found inspiration from a photograph of JFK’s brother, Ted, grieving after his brother’s untimely death. In the funeral photograph Ted Kennedy had his head bowed and his arms crossed. Shikler got to work and presented Jackie with a sketch of JFK in a similar pose – with arms crossed and head bowed. Jackie chose this sketch among all other sketches. Does he achieve this goal? I’m not sure. 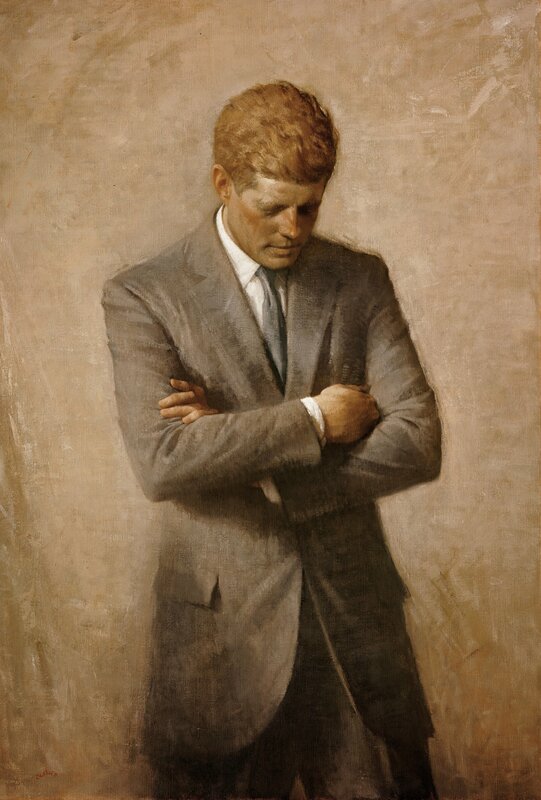 When I look at the painting, it seems that Kennedy seems out there alone and somber. As it hangs in the White House, Kennedy’s portrait stands out against the crowd of the more nobly-posed presidents. In the end, I think that Shikler succeeded in painting a memorable image of the late president. When my students ask, “Why is JFK looking down in his painting?,” I answer my students with a question. “Why do you think the artist would paint Kennedy in such a way?” It’s a great discussion starter, and it dovetails perfectly with discussing the man who has become a beloved American icon after a tragic death. Perhaps the painting references JFK’s assassination. Maybe it references the personal struggles of Kennedy. Ultimately, I think that it’s a painting that tells the story of an early end to a vibrant life. And who else could choose a better image to represent the man than his wife, Jackie? Additional note: It is worth mentioning that, among other paintings, Aaron Shikler painted a portrait of Jackie Kennedy that still hangs in the White House (see below). Previous Post Was James K. Polk a good president? Next Post $100,000 bill: Which presidents are on money?